Announce: CSGOFade.Net Will be back online as a Multi JackPot platform! After some time we come back with new forces and new systems, as the title says the CSGOFade website will be back online as a Multi JackPot platform soon. A special system for Counter-Strike: Global Offensive trade, this means we will accept these items / skins. We will accept all game items available on Steam, of course, if we have a price for that items. Stay frosty and wait for it. 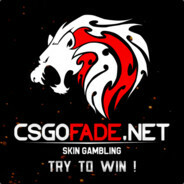 The official redirect link of CSGOFade to the network it's http://csgofade.vip/ check it out. Thank you for your time, have a nice day, dear friend. Привет, интересует покупка скинов и различных игровых аккаунтов с пожизненной гарантией по очень выгодной цене? Если хотите посмотреть инвентарь, просто добавьте меня в друзья!